Oftentimes, when Bev and I are beachcombing along the river shore, we’ll spot an occasional butterfly. Sometimes it will flit along beside us for a few minutes. Those of you who have been following this blog for awhile will recall my cousin, Lona, who passed away last year in November. She was my age and had been bedridden and a convalescent home resident for a couple of years. Bev also knew Lona for many years. And earlier this summer, on one of our earlier beachcombing trips, Bev remarked that the butterfly we saw could be Lona, joining us as we looked for shells and sea glass. And my mom had such a fondness for butterflies, I’m always reminded of her when I see one. Now, each time we see a butterfly on the beach, we smile as we remember those two very special ladies. This entry was posted in Family, Traveling Days and tagged butterfly at the beach. Bookmark the permalink. How unique. I don’t remember ever seeing a Butterfly at the beach. It makes you pause and wonder. Olde Town Photos is right. You never see butterflies at the beach! A very sweet post, Dianna. What a gift!! It’s been so long since I’ve been to a beach that I can’t remember if I ever saw one there!!! I think of Grandma whenever I see a butterfly. That’s why I got a cane with butterflies on it. Beautiful butterfly……I’m reminded of those who have moved on whenever I see a butterfly – when it lands on me – I know FOR SURE it’s someone I knew coming to say hello. I love it. Absolutely love it. Thanks for sharing a lovely image and some lovely ladies with us. Butterfly and the beach, so lovely! And what lovely thoughts to accompany them. A lovely photograph Dianna – and your association with two important people in your lives make it even more special. 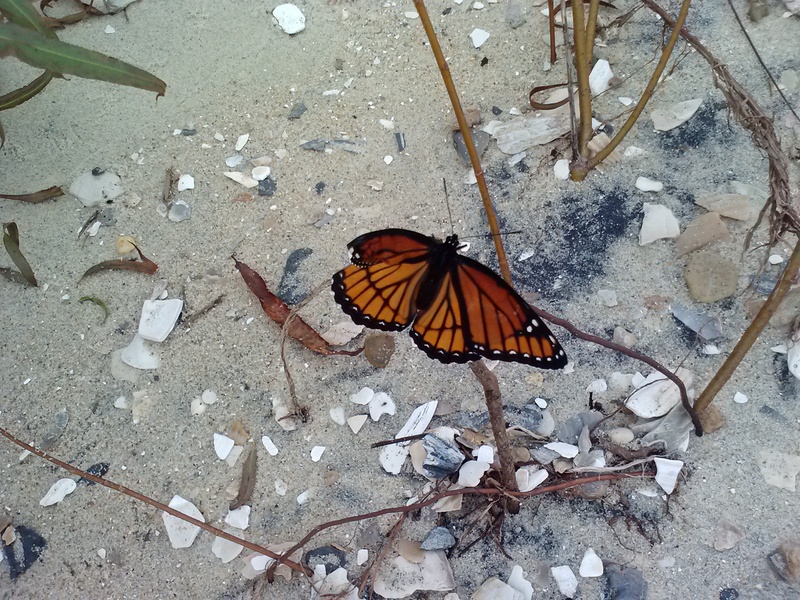 Similarly to a previous commenter, I was surprised that a butterfly would be on the beach. What a lovely way to remember Lona and your Mother. Beautiful picture. I’ve seen a butterfly a couple times on the beach, it’s such a unique treat. I’ve always had a fondness for butterflies, they’re so elegant while in flight. We saw butterflies at some of the beaches on our trip. The area of Myrtle Beach we visited had flowering plants between the boardwalk.